You might not know what a penny-farthing is by name, but there’s a good chance that you’ve seen one in an old photograph. These Victorian-era bicycles had one very large wheel in the front, along with a much smaller wheel in the back. Penny-farthings have enjoyed something of a renaissance in recent years thanks to their unique style, but while modern penny-farthings are mostly novelty items, there were some important practical considerations that lead to their original design in the 19th century. When penny-farthings were first introduced in Europe back in the late 1800s, they didn’t have any chains or gears like the bikes we’re familiar with today. At the time, the only reliable way for people to get their bikes up to speed was to utilize the one big wheel in the front. A large front wheel allowed riders to go further and faster with each crank of their pedals. This made the chainless penny-farthings more efficient than they would have been with two wheels of the same size. Of course, the penny-farthing’s design did present some distinct challenges as well. Just climbing onto one without losing your balance was easier said than done. Penny-farthings were also notorious for sending people flying over the front of their handlebars. 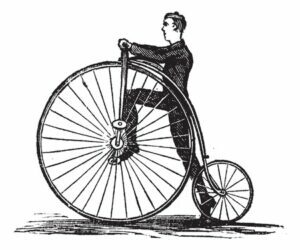 Penny-farthing accidents were fairly common, and before too long modern bikes with gears and chains surpassed them in popularity. But despite the fact that their practical use was limited to a few decades, penny-farthings have remained recognizable icons of cycling history for more than a century.